South Sydney’s Arncliffe and surrounding suburbs continue to undergo a residential renaissance, with the area transforming from a traditionally industrial precinct to become increasingly cosmopolitan in terms of modern, convenient, near-city living. Domus at 69 Bonar Street will offer townhouses and apartments to the market and is expected to be completed within 18 months. Matrix Property Group’s Glen McLachlan, on behalf of developer Vortex Property Group. According to Mr Soulos, the key features of the offering include the wide variety of living opportunities available, the modern and luxurious features contained within each, and the close proximity of the area to the Sydney CBD, Sydney Airport and major transport hubs. “Domus offers two distinct lifestyle choices between private, two-storey townhouses or five levels of apartment living, including studios, one, two and three-bedroom. “There are 22 different layouts to consider, ranging from spacious family residences and luxurious penthouses to easy-care studios. “This variety is a significant aspect of appeal – many properties on the market offer a selection of just one or two-bedroom apartments. Domus offers a variety of residences to suit many potential occupiers,” he said. Mr Soulos says they are expecting a mix of potential buyers including a strong take up from the local market. According to Mr Soulos the suburb of Arncliffe continues to get stronger. “Stemming from a traditionally industrial precinct, Arncliffe has become increasingly urbanised. “There has been plenty of residential development activity within the wider South Sydney market as industrial operators move further west, with proximity to facilities largely driving this growth,” he said. The property is situated three minutes from the Arncliffe railway station, is located just 18 minutes’ drive to the Sydney CBD with access via the M5, and is close to beaches including Brighton Le Sands. Several schools, childcare facilities, local shops, restaurants, a golf course, and parklands are all within close proximity. 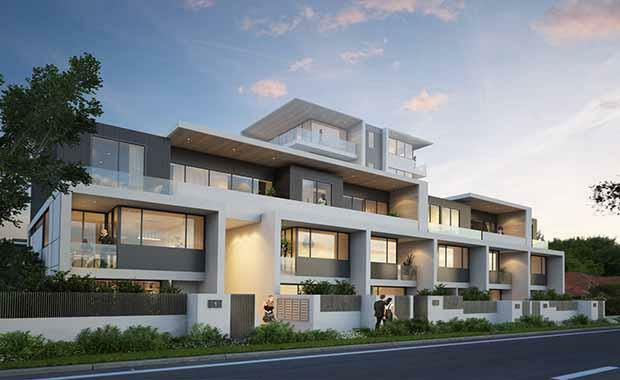 John Kavanagh of Baker Kavanagh Architects said, “Domus apartments and townhouses are eco designed, with many featuring relaxed district views. We have combined practicality with a sense of style and modernity, with close attention to detail. “Each of the Domus residences is designed to maximise light and air circulation to create a spacious, welcoming and relaxing ambience. Designer kitchens feature wok burners, stone bench tops, and glass splash-backs – it’s all in the detail,” Mr Kavanagh said.